Well here we are in Berlin, ready for another walking tour. We had a short walk of about 4 blocks to the U bahn (subway) that we would catch to Brandenburg Gate. While we were waiting, Brenna and I ducked into a bakery shop and we each got a huge, still warm pretzel for breakfast. We met with 156 others at the start point where they put us into smaller groups for the tour. The first Brandenburg Gate (2 pillars and a wood gate) was opened in 1734 and was a gate in the city wall where taxes were levied on goods. The current gate was built 1789-1791 and has a quadriga which is a 4 horse Roman chariot and is steered by Victoria, the goddess of victory. It was this quadriga that Napoleon plundered after beating the Prussian army in 1806 and brought back to The Louvre (Royal Palace) in Paris. After Napoleon was defeated, the statue was brought back to Berlin. The gate has since become the symbol of Berlin to celebrate military victories and parades. It is the Berlin version of the Arc du Triomphe. The gate was heavily damaged in World War II (only 1 horse's head was still intact). The gate has since been restored. Then for 28 years between 1961 and 1989 when the Berlin Wall was up it was inaccessible as it was in the prohibited zone. The next thing we saw was Berlins Holocaust memorial called The Memorial to The Murdered Jews of Europe. It contains 2711 dark grey concrete blocks and covers one whole city block. From ground level, the tops of the blocks vary in height then as you enter the field of blocks the ground drops and varies in depth. Some blocks on the outer edge are flush with sidewalk level and in the interior some blocks tower about 15 feet high. Some blocks are level and others lean slightly. It is a rather interesting, modern, interactive art sculpture. Next we stopped in a parking lot between some apartments. Beneath this spot is the location of Hitler's bunker where he committed suicide. 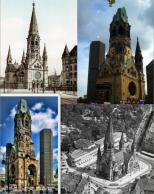 After the war, many of the surviving Nazi buildings were destroyed to de-Nazify Berlin. The Chancellor's residence that Hitler had built out of granite and marble to last for 1000 years of The Reich, was blown up after only 6 years and the bunker outside was filled with debris and then sealed with concrete, nothing remains. We then saw the Luftwaffe (German Air force) Headquarters building. This Nazi building survived because after the war it was used by the Soviet Military administration. Beside this building there is an intact section of the Berlin Wall still standing. After World War II West Berlin was split amongst the allies America, France and Britain and East Berlin went to the Soviet Union. East Berlin was under communist rule with no elected government. From 1949-1961 almost 3 million East Germans had fled for political reasons, jobs and better opportunities in the west. The economy in the east was collapsing so to keep citizens from leaving, a 155 km long wall was erected starting Aug 13 1961 and remained for 28 years. We went to Checkpoint Charlie which was 1 of 8 gates between east and West Berlin and was used by people with passports from the west, tourists, business people, military and political personnel. The west side of Charlie was patrolled by the US army and the east side by the Soviet army. The next stop was Gendarmenmarkt Square. In 1701, Elector Friedrich III (Friedrich the Great) had a cathedral built for the French citizens on the north side of the square and an almost identical cathedral was built on the south side for the German people. In the middle between the cathedrals is a theatre that he had built for the people, the first theatre outside a royal palace. From there we headed over to the university area where we stopped outside the library. It was here that people such as Albert Einstein, Sigmund Freud, and Karl Marx had studied. This was also the location of The Book Burning when, under the direction of Hitler, any book written for the Jews, by the Jews or about the Jews were ordered destroyed. 20,000 books were burned. There is a window in the sidewalk which you can look down into and see empty shelves where books should be. Our final stop on the tour took us to Museum Island. We saw the National Galleries Museum and the Berliner Dom (cathedral). It was only built in 1905 but was made to look much older and was built big to look powerful and intimidating. Across the gardens they are in the process of rebuilding the Royal Palace which once covered a city block and was partially destroyed in the war then levelled during the de-Nazification of Berlin. They are now spending about $800 million Euro on a Royal Palace but there is no Royal Family! After the tour, Brenna and I strolled around and backtracked our way to Checkpoint Charlie and read some more history about the wall and stories of people affected and escapes. At least 136 people were killed trying to escape. About 3000 are thought to have escaped successfully. There is now a double brick line demarking the route through the city where the wall once stood. We stopped at the site where the Gestapo Secret Police Headquarters and prison once stood and read about the rise and fall of The Reich. We then walked over to The Reichstag which is the Parliament Building. Atop it is a glass dome from which you can look down into the chambers. A reservation is required and it was closed by the time we arrived. From there we walked through Tiergarten Park past Berlins Victory Column. The park is almost 4 km long. Next up, was the # 1 thing I wanted to see the most in Berlin, The Kaiser Wilhelm Memorial. A cathedral once stood here but all that remains is the bombed out steeple and portions of walls. As we rounded the corner all I could see was the steeple of the new church and what appeared to be an office tower. Where is the old steeple? Noooooo, it is fully enclosed within a scaffold structure and is being restored !!! I couldn't even get a glimpse. How dissappointing L. We stopped at a sidewalk restaurant about 11 pm and ordered some pizzas. We both had a beer, the drinking age is 16 and beer is cheaper than soda pop. By the time we reached our hotel we had been gone more than 14 hours, another busy day.